COMPETITION RESULTS - SUMMER 2008 ISSUE. Many thanks for all your replies to our previous competition. Below are some interesting answers, in no particular order, to the problem of finding an original collective noun for Basset Hounds: A ...................... of Bassets. After much consideration and in a process similar to that of a papal election - the editor’s wife was bricked up for a number of days and when I spotted white smoke from the woodburner she was allowed to emerge with the winner's name. Judge Frankie’s comments: What struck me about Elizabeth’s entry was that is apt and so true. Also, I liked the connection with an embarrassment of riches. Our hounds are sometimes embarrassing treasures! Congratulations and well done, Elizabeth, your prize should reach you shortly. (Judge. No, absolute rubbish, didn't even make the final cut!). As the last competition tested your literary skills, I thought it would be interesting in this issue's competition to discover your visual talents and so we have a picture competition. The winner will be the member who sends in the most interesting and original Basset Hound photograph. 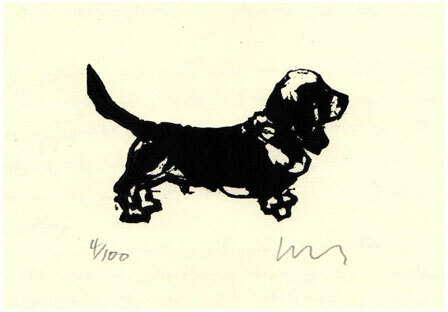 This time, the prize is very special; it is a small, original, lino-cut print by the canine artist, Ian Mason. This lovely image is hand-signed and numbered from a limited edition of 100. It will look super framed. RULES: So as to avoid any copyright infringements, the only stipulation is that the photograph must have been taken you. It can be either colour or black & white, and in digital or film format. Please send your submissions, which can be in the form of photographic prints, images on disc or emailed jpegs, together with your name and contact details to LOWDOWN by March 31st 2009. The summer issue of LOWDOWN will include the winning photograph together with the best runners-up. Please have a go and see your work in LOWDOWN! PLEASE NOTE: THE DECISION OF THE EDITOR'S WIFE IS FINAL.